We are so excited about our new relative finder feature! It is amazing to be able to use Embark’s research-grade test to help our customers learn more about their dogs’ family, and connect with other Embarkers! We hope that you are all enjoying exploring your pup’s family ties! As you explore relative finder, you may be wondering why we are reporting that pairs of dogs are “as related as” human relationships, such as first cousins. It turns out that estimating the actual relationships between two dogs from genetics alone can be more difficult in dogs than it is in humans. Genetic relatedness is the fraction of two dogs’ genomes that descend from the same ancestor(s). So how related are you to your close relatives? You probably already know that you are 50% genetically identical to each of your biological parents and that siblings are on average 50% identical. We say “on average” here because there is variation in how much shared DNA full siblings have due to recombination of their parents’ DNA. Going further out, you are about 25% related to your aunts, uncles, and grandparents, 12.5% related to your first cousins, 3.125% related to your second cousins, and so on. So, if your dog is about 12.5% related to another dog, does that mean that they are first cousins? It turns out that it’s not quite that simple. Just because two dogs are “as related as” first cousins, doesn’t mean that they have that exact pedigree relationship. This is particularly true for purebred dogs, where a limited number of founder individuals were used to create the breed, fairly recently in time. Because of this history of inbreeding, all dogs in a breed may be as related as first cousins (or even more so in some breeds), not because they are actually first cousins, but because they are third or fourth cousins several times over. 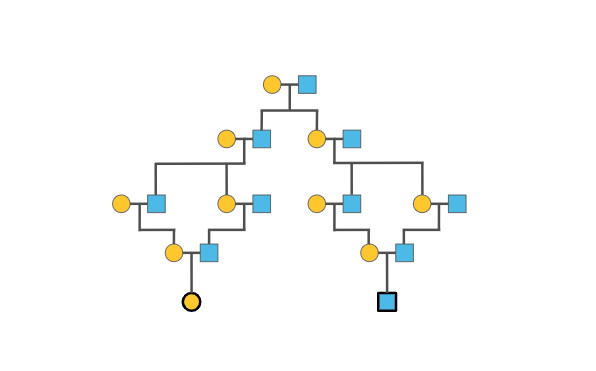 For example, Figure 1 illustrates a pedigree for two dogs that are as related as second cousins but are actually quadruple third cousins (they have 12 instead of 16 great-grandparents). The tremendous variation in the amount and duration of inbreeding across different dog breeds and populations of mixed breed dogs means that it is much more difficult to predict the pedigree relationship between two genetic relatives than it is in humans. As we collect more and more data we are working on improving this area of science– so you can expect to see improvements and upgrades to our relative finder over time! Until then, we hope you enjoy exploring this new feature and connecting with your pups relatives.